The Quang Minh Temple in Braybrook was the base of the Dalai Lama during his stay in Australia. The large Temple can accommodate more than 1000 people. 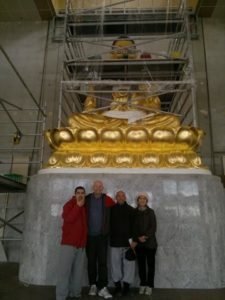 Art Gilding was approached to assist with the gold leafing of the five metre high Buddha Statue sitting on a one metre high lotus flower base. Under Master Gilder Karl Eggert’s leadership and guidance and with the help of four monks the Buddha Statue was covered with 23 carat gold leaf. Due to the hard work and dedication of everybody involved in this project everything was completed and ready in time for the arrival of the Dalai Lama. To honour everybody for helping to make this possible, Art Gilding issued special certificates of merits. 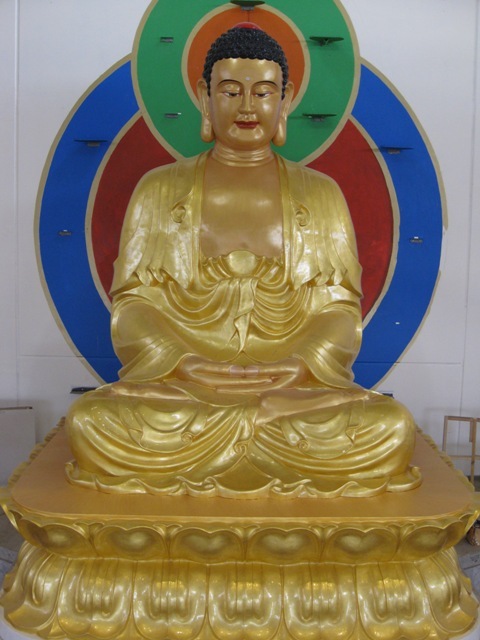 Two monks were on loan from the Thich Phuoc Hue temple (Sydney) to help gilding the Buddha. On completion of the project Karl and I were invited to the Phuoc Hue Temple to personally hand over the certificates to the monks Phuoc Lac and Minh Thong. We were granted the honour of a special audience by the 90 year old Grand Master. He is the President of the Vietnamese Buddhist Congregation of Australia and New Zealand. His title is The Most Venerable Thich Phuoc Hue, OAM. In appreciation of Karl’s work we were presented by the Grand Master with a large pot of orchids. It was truly an uplifting and memorable experience for Karl and me.